1. 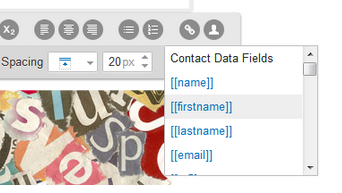 To create a custom field, choose Contacts in the Dashboard menu and go to Custom Fields. Click Add custom field, choose the type, name and define the default value. You can also create custom fields while creating any web form, all you need to do is to click Add new field available in the Design step. 2. Collect subscriber data by including the custom field on web forms and surveys or add them manually. 3. Personalize your messages by displaying custom information for each contact to increase the response rate dramatically. You can also personalize the subject of the message by typing the code manually or click the Personalize link. More information on personalizing the messages can be found here.